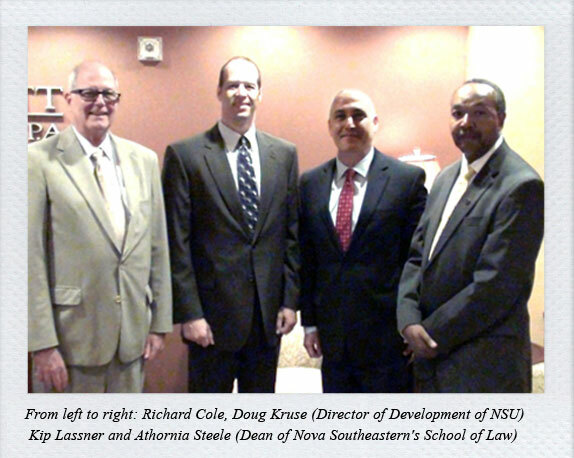 Athornia Steele, the Dean of Nova Southeastern’s School of Law, visited Cole, Scott & Kissane’s Miami office. Athornia Steele, the Dean of Nova Southeastern’s School of Law, recently visited Cole, Scott & Kissane’s Miami office to meet with our lawyers, including those from Nova Law School. The meeting was held over lunch and was designed for the firm and Nova Law School to get acquainted, to hear the Dean’s vision for the future of Nova Law School and to get some feedback from CSK about the firm’s experience with recruiting Nova graduates and the trends we are seeing in the practice of law and the legal community. The Dean shared his initiatives with our lawyers as well. CSK employs nearly 30 Nova alumni throughout its 10 offices. The meeting provided for a wonderful exchange of ideas and information between one of the largest Florida law firms and one of largest Florida law schools. Cole, Scott & Kissane, P.A. received the Seven Seals Award presented by ESGR. Cole, Scott & Kissane, P.A. received the Seven Seals Award presented by Employer Support of the Guard and Reserve (a Department of Defense organization) for meritorious leadership and initiative in support of the men and women who serve America in the National Guard and Reserves together with our work to support veterans and military related charities. 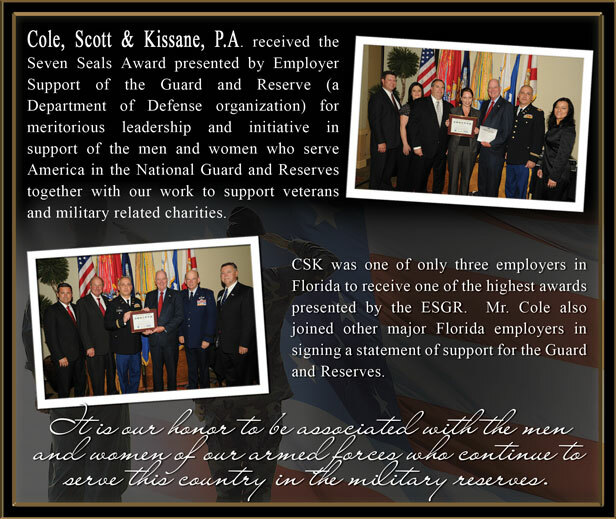 CSK was one of only three employers in Florida to receive one of the highest awards presented by the ESGR. Mr. Cole also joined other major Florida employers in signing a statement of support for the Guard and Reserves. It is our honor to be associated with the men and women of our armed forces who continue to serve this country in the military reserves. The Florida Supreme Court issued an opinion addressing mandatory e-mail service this past Thursday, June 21, 2012. The original opinion contained an effective date of July 1, 2012. A corrected opinion and correction notice were issued this afternoon providing a revised effective date of September 1, 2012. E-Mail service becomes MANDATORY on September 1, 2012 in civil, probate, small claims, and family law divisions of the trial courts, as well as in all appellate cases. (E-mail service in criminal, traffic and juvenile matters is not mandatory until October 1, 2013.). Links to the corrected opinion and the correction notice are provided below. The Florida Bar will provide complimentary education on the mandatory e-mail service requirements prior to the effective date. Are You Ready for Your First Civil Jury Trial? To access copy of article, please click here. The Florida Supreme Court handed down two decisions on June 21, 2012 (SC11-399 and SC10-2101) amending (among other rules) The Florida Rules of Civil Procedure and Judicial Administration. The Court adopted proposed amendments implementing mandatory electronic filing procedures for all documents filed in Florida courts. Additionally, amendments to the rules of court require e-mail service of pleadings and documents between parties. Opinion 10-2101 indicates mandatory e-mail service for all civil divisions of the trial court (including medical malpractice), as well as in all appellate cases, will be effective on July 1, 2012 at 12:01 a.m. Florida Rule of Judicial Administration 2.516 states: “all documents required or permitted to be served on another party must be served by e-mail. The amendments do not specifically state their application to Medical Malpractice and Nursing Home presuit periods and discovery documents. While these are not technically pleadings, in abundance of caution and for uniformity, it would be best to serve these documents through e-mail. Mandatory electronic filing will not begin for all Florida courts until 2013. On April 1, 2013, civil divisions of the trial courts (including medical malpractice), as well as for appeals to the circuit courts in will have to be electronically filed pursuant to Florida Rule of Judicial Administration 2.525. In the interim, each county clerk will be implementing an electronic filing system. Shortly after the recently issued Florida Supreme Court decision in QBE Ins. Corp. vs. Chalfonte Condominium Apartment Association, Inc. 2012 W.L. 1947863 (Fla. 2012), the Fourth District Court of Appeals issued its opinion in Goheagan vs. American Vehicle Insurance Company, 2012 W.L. 2121082 (Fla. 4th DCA 2012) which favorably decided a bad faith case for an insurer.The Fourth District Court, in a two to one decision, affirmed a summary final judgment in favor of an automobile liability insurer in a bad faith case predicated on an insurer’s alleged failure to settle. The insurer, following notice of a serious injury claim, made multiple efforts to contact both the injured party, who was comatose and later succumbed to her injuries, as well as various family members in an effort to tender the minimal bodily injury liability limits and protect the insured. The insurance professional was initially notified by a family member that the injured party was represented by an attorney, but the attorney’s contact information was not initially provided, nor in multiple follow up attempts to obtain same. The insurance professional finally made contact with the attorney after multiple attempts; however, by the time contact was made a wrongful death lawsuit had been filed. The carrier eventually tendered its $10,000.00 in bodily injury coverage sixty-one (61) days post accident. The plaintiff’s alleged that the insurer should have actually tendered its full policy limits and not simply made repeated calls to the claimant’s family. The policy limits tender was twice rejected and, although fully defended by the insurer, the result was a multi-million dollar excess verdict. In the resulting bad faith claim, the Appellate Court rejected plaintiff’s contentions and concluded that the adjuster’s “attempts to contact Goheagan five times would hardly appear to constitute the lack of diligence and care envisioned as an example of a bad faith claim.” While the plaintiff’s bar will contend that the impact of the decision should be constrained to the facts of the case, the Court importantly ruled that the insurer’s failure to offer or tender the policy limits to a party known to be represented by an attorney, when the attorney was not identified to the insurer, did not constitute bad faith as a matter of law. This finding was predicated on Fla. Admin. Code R. 69B-220.201(3)(i), part of the adjuster’s code of ethics, which prohibits an adjuster from attempting to negotiate a claim directly with a party known to be represented by counsel. The Court’s opinion appears to be largely swayed by the multiple efforts of the insurance professional to make contact with the claimant’s counsel which were repeatedly put off. The resulting lesson is that the adjuster and insurer who can demonstrate sincere and pro-active efforts to investigate and pursue settlement opportunities will have powerful, if not dispositive, evidence to oppose a bad faith action. This case also underscores the need to fully and accurately document in the claim file all steps taken by the claims professional to settle a case. It was the existence of these documented efforts that allowed the carrier to prevail on summary judgment. Should you have any questions concerning the holdings or implications of the Goheagan decision please contact Joe Kissane or Trevor Hawes in the firm’s Jacksonville office at telephone number (904) 672-4031. As a service to our clients and colleagues, Cole, Scott & Kissane, P.A., from time to time, will advise as to significant cases and/or developments in the area of insurance law. One such development occurred last week with the Supreme Court’s decision in QBE Ins. Corp. vs. Chalfonte Condominium Apartment Association, Inc. 2012 W.L. 1947863 (Fla. 2012). In the Chalfonte decision, the Florida Supreme Court answered several questions which had been certified to it by the Eleventh Circuit Court of Appeals. One of those questions involved whether an insured could bring a claim for breach of the implied warranty of good faith and fair dealing under the insurance policy prior to the accrual of a bad faith cause of action. In insurance contract litigation in Florida it had become commonplace for insureds to include, as part of their breach of contract action, a claim for breach of the implied warranty of good faith and fair dealing. In effect, these claimants were trying to file a premature bad faith action by disguising it as a contractual breach of the implied covenant of good faith and fair dealing. The Florida Supreme Court has ruled that first party claims for breach of the implied covenant of good faith and fair dealing are effectively statutory bad faith claims which must be brought exclusively pursuant to Florida Statute §624.155. This effectively means that any claim, in a first party insurance action, for breach of the implied covenant of good faith and fair dealing, would be premature and improper, as such claims must await determination of both coverage and damages in the underlying action. Upon conclusion of the underlying action, such a claim may thereafter be filed, however, it must be pursued pursuant to Florida Statute §624.155. Any such claim will require the filing of a Civil Remedy Notice providing the carrier with a sixty (60) day right to cure. The Chalfonte Court also determined that the failure of an insurance carrier to have hurricane deductible language in a certain type size as required by Florida Statute §627.701(4)(a) did not void the policy’s deductible. The Court concluded that since the legislature had not provided for a penalty for failure to comply with the type size requirement established in §627.701(4)(a) that there was no basis upon which to declare the hurricane deductible void. Should you have any questions concerning the holdings or implications of the Chalfonte decision please contact Joe Kissane in the firm’s Jacksonville office at telephone number (904) 672-4031 or email joe.kissane@csklegal.com. Paula Parisi says she had all the characteristics of a good lawyer at a very young age; she argued, caused trouble and was never wrong. After earning her undergraduate degree from the University of North Texas in just three years, Parisi attended law school at Texas Wesleyan University, where she earned her J.D. Today, Parisi splits her practice between medical malpractice and nursing home defense, with some slip and fall litigation sprinkled in from time to time. She cut her teeth in the public defender’s office before going to work with a medical malpractice defense firm in Fort Lauderdale before being transferred to Dallas. She spent a year taking family law cases for former clients before deciding it was time to get back into the medical malpractice game. It has been pure growth since Parisi started building the medical malpractice division within the firm. 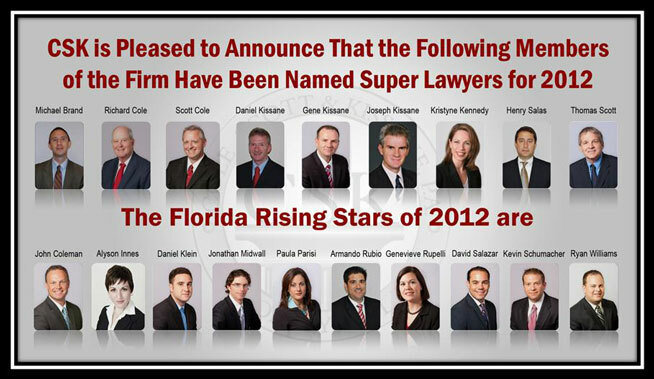 Even after tort reform hit Florida, and took plenty of malpractice firms down along the way, Cole Scott & Kissane continued to flourish in the medical malpractice realm. Cole, Scott & Kissane made Parisi a partner after just three years with the firm and appointed her the lead attorney over the medical malpractice division. The firm has over 200 attorneys and a large medical malpractice presence throughout the state. Parisi predicts more growth in her division as well. Until recently, it’s been hard for Parisi to make time for herself with the pressures of building a thriving practice within her firm. She’s learned that if she doesn’t make time for herself and family, she could burn out like many other attorneys so often do. Now, she embraces self-made free time by honing her culinary skills.